- Only single measurement below the canopy required. - High resolution hemispherical fish eye lens, digital camera with 150 degree wide viewing angle to analyze plant as well as forest canopies. 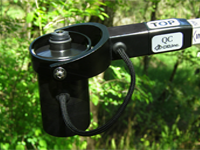 - Non-destructive measurement of Leaf Area Index. - Easy auto threshold adjustment allows work in any sky condition. - Captured image can be saved directly to the hard drive of the Laptop computer. - Powerful software installed to view and analyze the image on site. Powerful software installed to view and analyze the image on site. - Measuring time: 0.5 sec. - Image resolution: 768 x 494 pixels. - Probe size: 20 x 20 mm. - Arm Length: 400 mm.